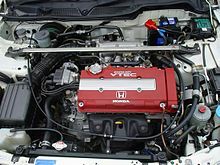 The B-series are a family of inline four-cylinder DOHC automotive engines introduced by Honda in 1988. 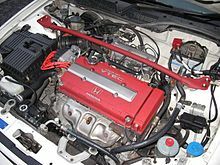 Sold concurrently with the D-series which were primarily SOHC engines designed for more economical applications, the B-series were a performance option featuring dual overhead cams along with the first application of Honda's VTEC system (available in some models). To identify a Honda B-series engine, the letter B is normally followed by two numbers to designate the displacement of the engine, another letter, and in US-spec engines, another number. The Japanese spec-engines are normally designated with a four character alphanumeric designation. 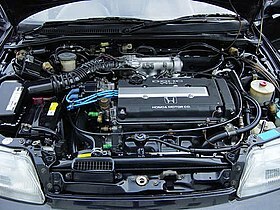 The B-series, the B20B variant in particular, is not to be confused with the earlier Honda B20A engine introduced in 1985 and primarily available in the Prelude and Accord-derived vehicles from 1985-1991. While sharing some design elements and both being multivalve Honda four-cylinders, the B-series and B20A differ substantially in architecture, enough to be considered distinct engine families. They were made in 1.6 L (1,595 cc), 1.7 L (1,678 cc), 1.8 L (1,797 cc), and 2.0 litres (1,973 cc) variants, with and without VTEC (Variable valve Timing and Electronic lift Control). Later models have minor upgrades including modifications to the intake valves and ports and piston tops, along with individual cylinder oil injectors (B18C models). They produce between 126 hp (94 kW; 128 PS) and 190 hp (142 kW; 193 PS), with some models capable of a redline over 8,500 rpm. Although it has many variations, the basic design differs very little among the B-Series. There are actually two short blocks which are used for the entire series. The distinction between them was the cylinder block deck height. The one used for B16 and B17 engines (except for B16B) has a deck height of 203.9 mm (8.03 in) while the short block used for B16B, B18 and B20 engines has a deck height of 212 mm (8.3 in). The Honda B16 has appeared in six different forms over the years. The Honda B-series was replaced by the K-series in Civic, Integra, and CR-V applications. Note: Only offered with SiRs with automatic transmissions. First DOHC VTEC B series to be marketed in North America as export only. Not available in Japan. Came equipped with the YS1 cable transmission, which was different from other cable B-series YS1 transmissions as it has a different input shaft and a shorter final drive. The Japanese B18A is not considered part of the modern B-series family. This engine shares many characteristics with the B20A/B21 See Honda B20A engine. Transmission: YS1, cable. Larger input shaft than 90-91. Uses same clutch as 94+ B series hydro. JDM version is marked B18B on the block without any number. JDM version has 9.4:1 compression ratio whereas the USDM version has 9.2:1. Transmission: S4C(non B16A ratios), S80? Transmission: S9B 4.26 final drive Torsen LSD. The B20A3 and B20A5 are the predecessor to the B family. All B-series engines were based from the B20A, but most engine components are not compatible. For more information, refer to the F3-series Honda race car that used a B20A engine. Also see Honda B20A engine. Note: All (1992 up, non-Prelude) "Big Spline" B series Transmissions are interchangeable. YS1 casing can take S80 Internals or a hydraulic conversion kit can be used to operate hydraulic transmissions in cable operated models, however A1/S1/J1/Y1 internals do not swap into the later model YS1 or hydraulic casings due to different shaft diameters. Note: Torsen LSD is the same as a S80 Helical LSD but with a different brand name, nevertheless both LSD share the same part number by Honda in UK and Europe (41200-P80-003). ^ Jason, Siu (2008). Honda B-series engines. 39966 grand ave North Branch MN,55056. p. 6. ISBN 978-1-932494-78-5. ^ Super User. 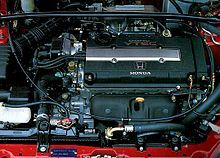 "JDM Spec Engines - Honda B-Series Engines". 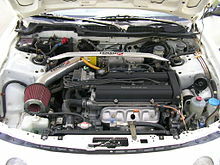 jdmspecengines.com. ^ "1997 Honda Civic Type R E-EK9". Carfolio. Retrieved July 1, 2018.